The historic town Skalica is situated on the foot of the White Carpathians near the Morava river, 90km from the capital Bratislava. Since the year 1996 has been the district town and is considered as natural centre of the Northern Záhorie. The first written mentions of Skalica originate from the years 1217 and 1256. In the documents of that time Skalica is mentioned under the name "Zakolcha". The Hungarian king Ludovit I. st. awarded Skalica privileges of a "Free Royal Town" on October 6, 1372. Skalica - a historical town - that is witnessed by many cultural monuments - 6 big and 3 smaller churches, 3 bigger and some smaller chapels, 4 monasteries, the column of pestilence from the end of the 17th century, the Classicistic Calvary, town fortification, some burgher´s houses. 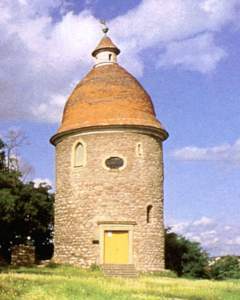 The Romanesque Rotunda of St George is the oldest well preserved building monument in Skalica. It probably originated at the beginning of the 13th century when it formed a constituent part of a bulwark on the elevation in the northern periphery of the town. Some fragments of mural paintings representing a motif of the legend of St George are preserved from the Gothic period. In the year 1970 was declared the national cultural monument. Nowadays there is a permanent exposition of the "Záhorské múzeum". The most important event of Skalica are the Skalica´s days which take place in September every year (this year the XI. th year on September 15-17). During the whole week many cultural, social and sports undertakings take place. The weekend belongs to the big Market with a rich program under the name "Ve Skalici na rínečku...".